Welcome to the new Stratagen 2 website. With this small tool you can easily create and edit .bmp's which can be used as strata textures in Terragen. And you can use the created strata textures also with the new Terragen 2 Tech Preview or many other programs! 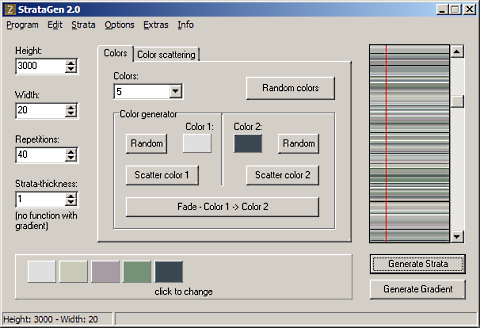 Stratagen 2 is freeware. The program can be used for non-commercial and commercial purposes. You are not allowed to sell the program. To download these files please right-click on them and choose "save as...". Here is a tutorial for using strata texture in Terragen 0.9.x.x. The tutorial is available in english and german.